Contact - Die Wohlfühlpraxis: "Sie sind einzigartig und so behandeln wir Sie auch"
Our office is located at Seitzstr. 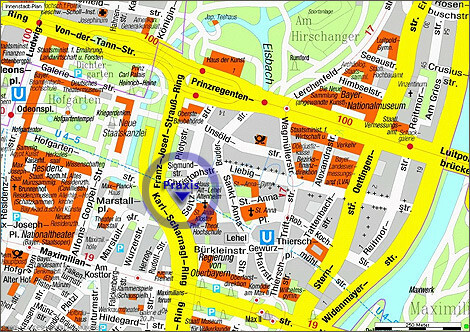 7, 80538 Munich and public transportation is available near by (see blow). Please call +49 (0)89-2196 2434 for an appointment. We operate by prior appointment only. Office hours are Tuesday through Friday from 8:30AM to 9PM. For a maximum of flexibility we may also offer appointments on weekends. We apologize that we may not be able to answer the phone during treatment. Please leave a message and your phone number on our voicemail and we'll get back to you asap. Consultation and treatments are fee based, independent of your health insurance. Should you possess private health insurance we'll provide a detailed invoice for reimbursement with your insurance company. Should you not be able to maintain your appointment or have to reschedule, please notify us in due time. Notification must be received at least 24h prior to your assigned appointment or we'll have to charge a penalty fee of 75€. U4/U5 or Tram 16, Lehel station.